Since moving to Wales I've felt drawn to understand more about our connection to the land through the reading the old myths and stories. 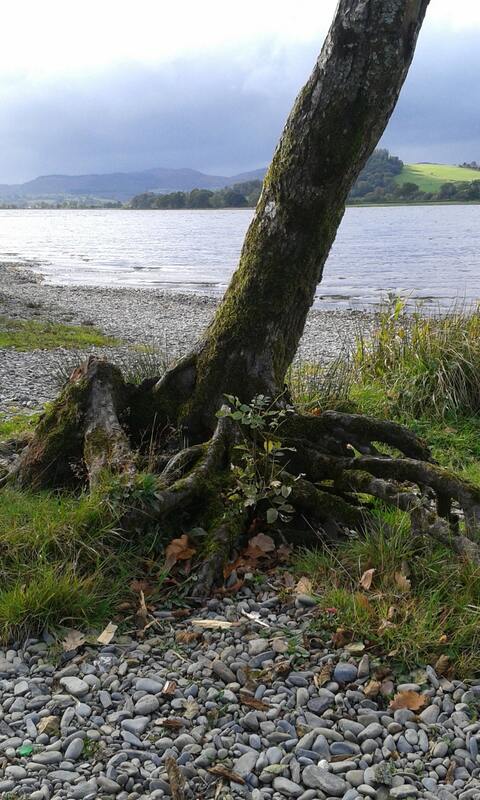 I discovered that the story of Cerridwen and Taliesin took place on the shores of Bala Lake. I can see the lake everyday while walking in the hills above my house and began to study the tale in more depth by reading 'From the Cauldron Born' by Kristoffer Hughes and found it to be a powerful and transformative story filled with hidden meanings and archetypes. I have written my own version of the story below and also have uploaded some pictures I took of the lake which have been direct inspiration to me. I feel this painting has been 'brewing' in my mind for quite sometime, I first had the vision of how I wanted it to look whilst stood next to the tree (pictured) on the shores of the lake and imagined the story playing out before me in a huge spiral on the lake, I've included the mountain range of Aran Fawddwy which sits above the lake in the background of painting, it always feels so magical when you catch sight of it's double peeks. 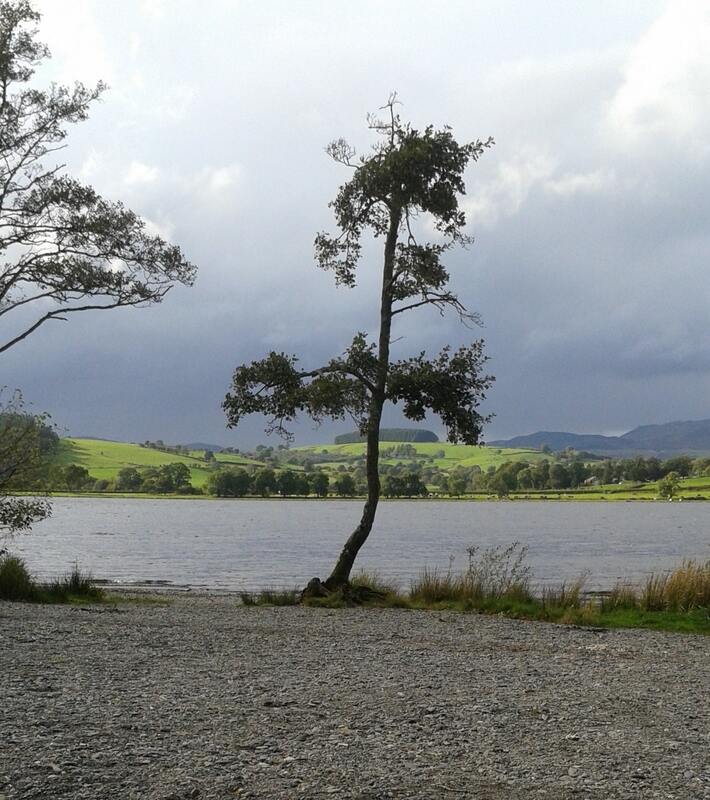 Far below the majestic peaks of Aran fawddwy on the shores of the sacred lake known as Llyn Tegid (Bala Lake) lived a powerful and wise witch by the name of Cerridwen, she was married to the nobleman Tegid foel who gave his name to the lake. They had two children a daughter known as Creirfyw or ‘The finest’ as she was the most beautiful graceful creature who ever lived and a son Morfran or ‘Sea Crow’ who was as hideous as Creirfyw was fair, his ugliness was such that he was renamed Afagddu meaning utter darkness and he was shunned by all who laid eyes on his monstrous form. Cerridwen loved her son dearly and her heart was saddened deeply by his lack of acceptance in the community so she decided to help him using the three crafts she possessed; magic, witchcraft and divination. 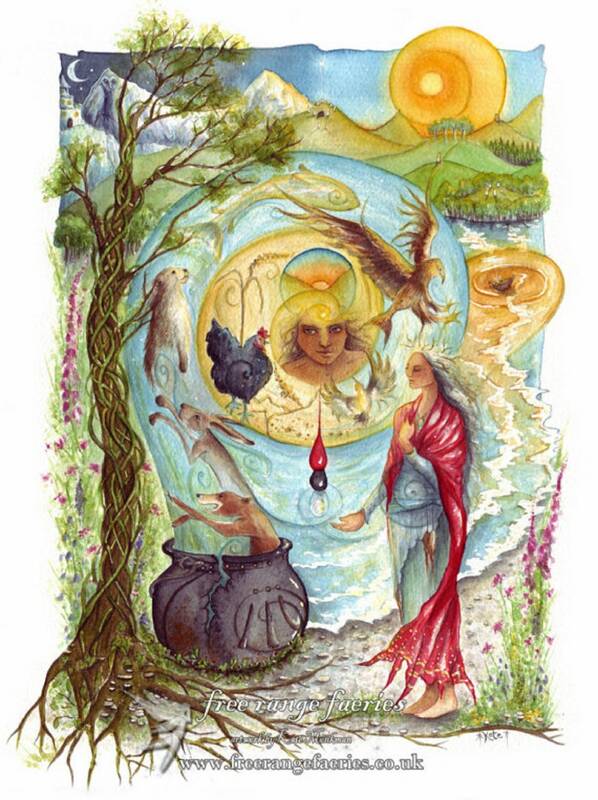 If Afagddu could not be beautiful he could be wise and she set about creating the brew of awen in her mighty cauldron. 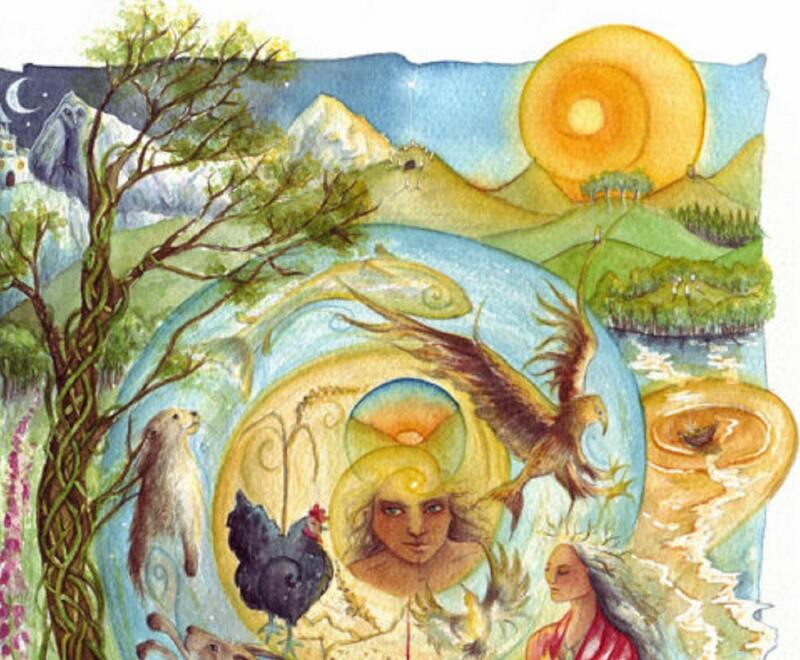 Awen was the flowing spirit of inspiration itself and once it was prepared Afagddu would only need three precious drops to become wise beyond all measure and the greatest of all the storytellers and then surely he would be loved by all. The potion of awen is not easy to create, it takes a year and a day of hard strenuous labour so to help her in her task Cerridwen employed the blind man Morda to stoke the fire and a small boy Gwion Bach to constantly stir the brew. Cerridwen herself would be kept busy constantly collecting all the magical herbs, plants and fungus's needed from the lakes shore to feed the bubbling brew. When the magical concoction was almost ready Cerridwen rested against a tree stump exhausted from all her hard labour. Contented that soon Afagddu would be wise beyond measure she drifted into a deep sleep just as the contents of cauldron began to boil. As Morda stoked the fire and Gwion Back frantically stirred suddenly they heard a crack as the cauldron began to break open spitting out three drops of hot scolding liquid onto Gwions thumb. He cried out in pain as he stuck his thumb into his mouth to try to cool his burning flesh, in that moment Gwions eyes rolled back into his head as he became filled with all the knowledge of this world and the otherworld, becoming the prophetic spirit of awen itself. As the cauldron shattered into a million pieces its three drops of awen gone the rest of the brew became a toxic poison seeping into the lake and Cerridwen’s eyes flew open in rage. Gwion Bach was now filled with a power and knowledge to rival Cerridwen’s and instantly knew of her fury. He ran for the hills shape shifting into a hare so he could run faster, Cerridwen shifted into a greyhound and began to gain ground on Gwion who had by now reached a stream, jumping in he turned himself into a salmon, Cerridwen jumped in after him becoming an otter, Gwion feeling the otters whiskers on his tail turned instantly into a wren and flew up from the stream, Cerridwen now a hawk was fast in pursuit, exhausted from the chase Gwion spotted a pile of grain on the floor and headed towards it turning himself into a single grain of wheat. Never one to give in Cerridwen turned herself into a large black hen and proceeded to gobble at the pile of grain. Cerridwen sure she had won the chase soon discovered the magical grain had grown in her belly and she was with child, enraged she vowed to drown the babe in the lake as soon as it was born. When the time came and the babe flowed out along with her screams she looked down at the child, bestowed with the gifts of awen he was the most beautiful child she had ever seen and she couldn’t find it in her heart to kill him. 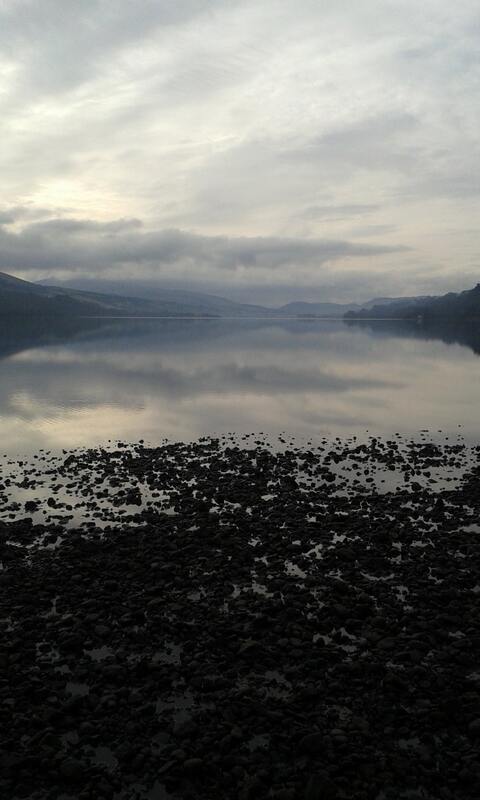 Instead she set him adrift into the sacred waters of Bala Lake inside a leather coracle. Eventually one Samhain eve the coracle was discovered by Gwyddno’s son Elffin, amazed by the beauty and otherworldliness of the child inside Elffin named him Taliesin or Shining brow. Taliesin went on to became the most famous bard in Britain and is said to be the basis of Merlin.